Jo Weisenthal writing for the Business Insider claims Ben Bernanke Just Murdered The Gold Standard. In an equally feeble post, Simone Foxman also writing for the Business Insider writes Ben Bernanke Explains Why The World Will Never See Another Gold Standard. Please consider a snip from a free eBook on Mises.Org by Murray Rothbard, What Has Government Done to Our Money? That snip is on page 29. Inquiring minds should start reading on page 26, the beginning of the chapter The “Proper” Supply of Money. Moreover, I would like to point out that if there was a "proper" supply of money, different than stated above, the jackasses at the Fed (and the bubbles they have blown) have without a doubt proven they sure do not know what it is. As Russia (and numerous other countries) have proven throughout history, the very idea that a bunch of central planners sitting in a room can decide on the proper supply of virtually anything is inane. Only free markets, operating without artificial interference from clueless bureaucrats can do that. Simone Foxman continues with still more economic drivel. Now that's pretty interesting. Simone admits that prices under a gold standard remain stable in the long term but she, like Bernanke is worried about the short-term. There are two errors in in that short snip. Did you catch them? The first error is prices under a gold standard are not necessarily stable in and of themselves (short or long-term). Rather prices are relatively stable under a gold standard if and only if banks do not lend out more gold than there is. History shows that alleged problems of the "gold standard" are primarily a problem of central bank interest rate manipulations in conjunction with fractional reserve lending that allows banks to lend out more money than there is gold backing it up. The John Law Mississippi Bubble is a classic example. Certainly when it comes to short-term price stability, the Fed does not have a leg to stand on. The housing bubble and its collapse and the dot-com bubble and its collapse are proof enough. How anyone could miss those analogies is nearly beyond belief, but Simone Foxman managed to do it. [Bernanke] pointed to a substantial tome of economic research finding that the gold standard aggravated the Great Depression, saying "the gold standard was one of the main reasons the Great Depression was so bad and so long." The inability of the Federal Reserve to control monetary policy—open up credit, address unemployment, and drive business demand—left it with much less power to avert or mitigate the decade-long crisis. Bernanke added that countries not tied to the gold standard also had a much easier time getting out of the Depression. In the modern world, he said, "we've seen that problem with various kinds of fixed exchange rates." In other news, Bernanke said "pigs can fly" and Foxman concluded "pigs can fly". Seriously, just because someone in authority says something, does not make it true. Proper analysis shows the true cause of the great depression was the enormous runup in credit and money the preceded it, just as happened in the Mississippi Bubble scheme. With that in mind, it is beyond silliness to propose more credit and more money is the cure for a problem caused by too much money and too much credit. To believe so is to believe the solution to the Mississippi Bubble would have been to print still more money in the wake of that economic collapse. Foxman concludes with "Sorry, Ron Paul. We think Bernanke just destroyed your position." I conclude Foxman cannot think on her own accord, accepting economic drivel as fact because it comes from a position of authority. Let's now turn our attention to a point-by-point rebuttal of economic drivel presented by Jo Weisenthal. Weisenthal: To have a gold standard, you have to go dig up gold in South Africa and put it in a basement in New York. It's nonsensical. Mish: In my rebuttal to Simone Foxman, I stated that any amount of money was sufficient. One does not need to dig up more gold to have a proper supply. However given the credit bubble and the housing bubble, it should be quite clear we had vastly more supply of paper money than needed. Weisenthal: The gold standard ends up linking everyone's currencies. Mish: So what? Look what happened after Nixon closed the gold window. We have had nothing but problems, temporarily masked over by printing more money until things blew sky high, culminating in bank bailouts at taxpayer expense, and those on fixed income crucified in the wake. Bear in mind, no one needs to fix the price of gold in dollars or any other currency. Indeed that is the wrong way to do it. Rather, one dollar should represent "x" amount of gold. As long as fractional reserve lending does not come into play and banks do not lend out more money than they have gold, problems under a gold standard would be far less than they are now. History suggests the same. By the way, nothing about "linking" stops devaluations. For example, suppose the Drachma is defined as 1 drachma is redeemable for 1/1000th of an ounce of gold. Tomorrow, nothing stops the Greek government from saying, effective immediately you can only get 1/2000th of an ounce of gold for a drachma. That is a 50% devaluation, something Greece is unable to do now, on a "Euro standard". Weisenthal: [A gold standard] creates deflation, as William Jennings Bryan noted. The meaning of the "cross of gold" speech: Because farmers had debts fixed in gold, loss of pricing power in commodities killed them. Mish: Hello Joe. Please tell me how many in this country would not like to see lower prices at the gas pump, lower prices on food, lower rent prices, lower prices on clothes? 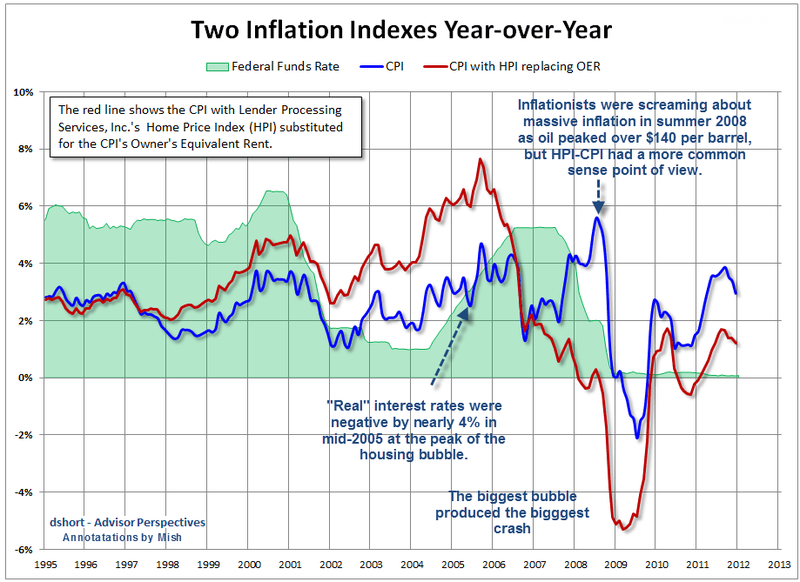 The fact of the matter is price deflation is a good thing. The only reason why it seems otherwise is debt in deflation is harder to pay back. That is not a problem with deflation, that is a problem of banks foolishly lending more money than can possibly be paid back. Fractional reserve lending is the culprit. Weisenthal: The economy was far more volatile under the gold standard (all the depressions and recessions back in the pre-Fed days). Mish: Really? On what planet? Did the collapse in the housing bubble affect your ability to reason? Except for cases like Weimar, Mississippi Bubble, and for that matter all bubbles, gold provided stability. The bubbles (and the subsequent collapses) were caused by fractional reserve lending, not the gold standard. Weisenthal: The only way the gold standard works is if people are convinced that the central bank ONLY cares about maintaining the gold standard. The moment there's a hint of another priority (like falling unemployment) it all falls apart. Mish: That is one of the silliest defenses of paper money I have ever seen. The fact of the matter is, the ONLY reason paper money works at all is governments mandate its use. The free market would never except as money something that can be created at will in infinite supply. The idea that gold would "fall apart" in the case of employment conditions is simply inane. Weisenthal: Gold standards leave central banks open to speculative runs, since they usually don't hold all the gold. Mish: In a series of weaker and weaker arguments, Weisenthal proves 100% without a doubt he does not know a damn thing about either gold or what causes bank runs. Duration mismatch - Banks secure money for 5 years via CDs then lend the money for 30 year mortgages. The problem comes when people want their money back after 5 years and it isn't there. Both practices are fraudulent. They are the equivalent of selling the Brooklyn Bridge without having ownership of it. Government sponsored monetary printing, frequently but not always to fight absurd wars that have no justified explanation. The War in Vietnam and the War in Iraq are recent examples. Is There a Bubble in Treasuries? Both Sides of the Case; Explaining the 2011 Treasury Rally (It's Not What You Think); Where to From Here? Here is the key chart and commentary from the first link. The Fed kept interest rates at historic lows between 2002 and mid-2004. The last two rate cuts by Alan Greenspan were not justified at all, by any measure, and downright absurd considering the bubble brewing in housing prices vs. rent. 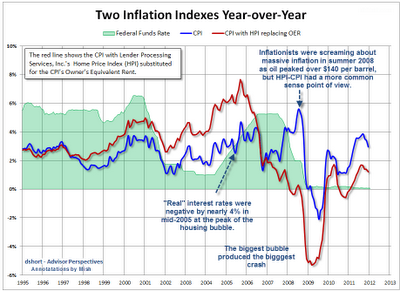 Certainly the Greenspan Fed ignored (cheerleaded is a better word), the housing bubble every step of the way. Bernanke defended the housing bubble and failed to see its consequences. The most amazing, and galling thing, is Bernanke has the nerve to preach about "price stability" in the wake of that collapse. The following video should make people think twice about listening to anything that Chairmen of the Fed Ben Bernanke says. It's a compilation of statements he made from 2005-2007 that will have your head spinning. Please play that video. Bernanke proves over and over again he is a clueless jackass, devoid of common sense. Finally it is important to point out it is those with first access to money that benefit from inflation. Who is that? By the time money is readily available to any fool who wants it, it is primarily fools who want it. Once again, the housing bubble is proof enough. Those on fixed income and those in the middle class have been hammered by Fed policies. If you are looking for a reason for the shrinking middle class, then look at the Fed. For some reason Jo Weisenthal and Simone Foxman are not only listening to Bernanke's economic drivel, they actually believe it and are attempting to spread the word.